President Uhuru and Deputy President Ruto mourn 9 band members – Kenyatta University TV (KUTV). All Rights Reserved. 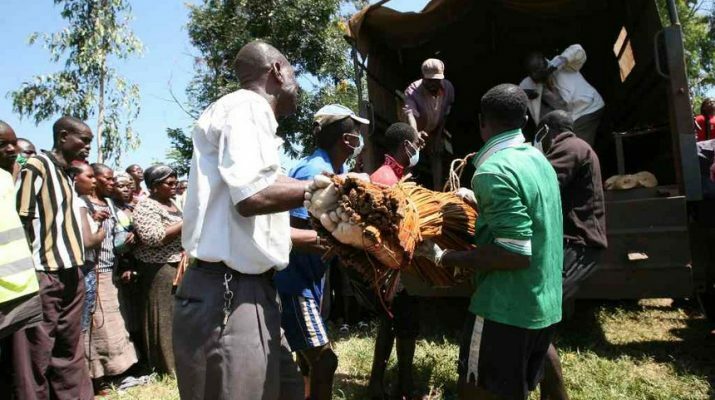 President Uhuru Kenyatta and Deputy President William Ruto joined Kenyans in mourning the nine members of the Boyieta Wuod Awasi band. They died on June 25 after their boat capsized near Lihunda beach, Siaya county. The President said the tragedy stilled the voices of some of Kenya’s most talented and distinctive artists. Joe Okudo and Ambassador Richard Ekai – PSs in the Sports ministry – and a number of senior government officials represented President Kenyatta at the funeral. They delivered messages of condolence to each family. Uhuru and Ruto have donated Sh100,000 to each family and Sh200,000 to buy new equipment to help rebuild the band. The Permanent Presidential Music Commission has also been directed to train and mentor the band, as it reestablishes itself after the loss.